I'm going to give you some 'secret tips' to maximize the benefits that you get out of your Hydro Floss. It is truly an awesome machine. The whole point of using it is to help protect your dental health. Over the years I have talked to many people about their Hydro Floss and how they use it. Most of the people are getting great results but I occasionally run into someone who is not getting the results expected. When I ask a person in this situation about the frequency and quantity of use I almost always find out they have not been using it enough! While it is truly impossible for everyone to get great results, many people should get good results. Sometimes the people I mentioned above are using their Hydro Floss as little as once every other day and only a quarter of a reservoir (tank) per use. That is far to infrequent to get good results! The ideal usage is this: Use the Hydro Floss twice per day and two full tanks (reservoirs) per use. If you want to optimize what you get out of your machine that is what you should consider doing! Sound Like a Lot? NO, actually it is not that much. 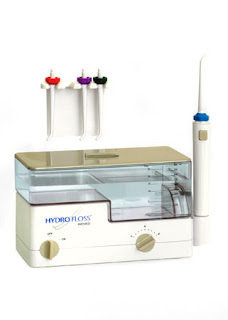 If you put your Hydro Floss on the number 9 setting (or the "high" setting on older units) you can drain a full reservoir in 2 minutes and 10 seconds (approximately). That means two reservoirs in the morning is under 5 minutes and two in the evening is also under 5 minutes. That's less than 10 minutes per day to get the 'best' results! If you are not getting the results you want from your hydro floss as measured by your dentist or periodontist (periodontal pocket depths) then consider increasing your usage to this recommended amount. If your pockets are good, as measured by your dentist or hygienist, just keep doing whatever you have been doing! Many people will experience a slow down over time with their hydro floss, this can be due to the buildup of minerals on the inside of the machine. You can test it by filling up a single tank and putting your unit on 'high' or '9' and time how long it takes to drain a tank - it should be around 2 minutes and 10 seconds. Any more than that means your machine is not performing as well as it should. Your 4 reservoirs per day will therefore take correspondingly longer! One tip you can use to help extend the life of your machine is to run a quarter cup of white vinegar through it once or twice a month. Remember to run a full reservoir of water behind that so that you don't get a vinegar taste in your mouth the next time you use your machine. This can help to keep the mineral deposits to a minimum. Of course, if you have hard water, the mineral deposits inside may build up quicker. I can probably provide more information about your specific questions, feel free to call me at 1-888-586-6849. You can read more about this wonderful machine Here.